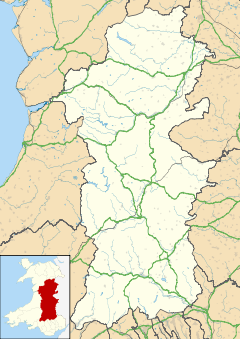 Abermule (Welsh: Aber-miwl) is a village lying on the River Severn 6 km (4 miles) northeast of Newtown in Powys, mid Wales. The A483 Swansea to Chester trunk road, the Cambrian Line railway, connecting Aberystwyth to Shrewsbury, and the Montgomery Canal, close to the river, all pass through Abermule. 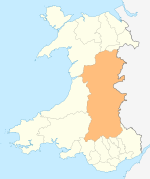 The village is part of the Abermule with Llandyssil community. The village has one primary school - Abermule CP School; previously called Dolforwyn CP School - a village shop, a caravan park, a growing number of new houses, a community centre/playing fields, two parks for children, a bowling green, two tennis courts, and one pub - The Abermule Hotel. Abermule is also home to Wales's first privately owned natural burial site, Green Lane Burial Field. Nearby are the remains of Dolforwyn Castle, the only castle built by the last native prince of Gwynedd of direct descent, Llywelyn ap Gruffudd, Prince of Wales. In 2006 a Roman Road was found while building the Felin Hafren estate. Abermule railway station was closed as part of the Beeching cuts in 1965. The Cambrian railway users group has called for the reinstatement of this station. Abermule had earlier been the junction for a short branch railway to Kerry, closed in 1956. The Abermule train collision on 26 January 1921 killed 17 passengers, including the Cambrian Railways chairman, Lord Herbert Vane-Tempest of Machynlleth. Abermule is served by regular bus services to Llanidloes, Montgomery, Newtown, Rhayader, Shrewsbury, and Welshpool. Composer Philip Heseltine, pseudonym Peter Warlock, lived at Abermule before and after the First World War. Abermule FC, who play behind the Primary School in the centre of Abermule, has been part of the Montgomeryshire leagues for 39 years. The current team is co-managed by Steven Morris and Michael 'Smithy' Fletcher. Wikimedia Commons has media related to Abermule. ^ "Powys County Council - Election of Community Councillors" (PDF). Government of Powys. Retrieved 22 May 2017. ^ "BBC NEWS - UK - Wales - Mid - Bookings soar for 'green' burials".